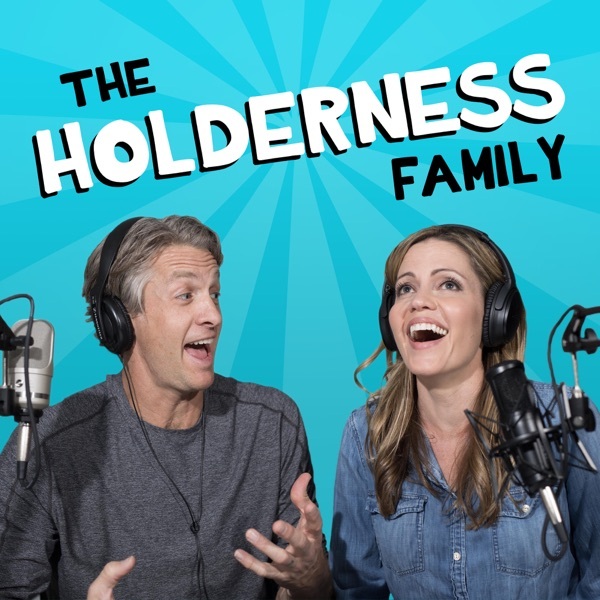 Love this podcast for a fun light-hearted visit with the Holderness family each week! I love your podcast and I'm binge-listening and catching up with them now. They are thoughtful, informative, and funny. Thank you! In the spirit of Valentine’s Day, our latest podcast episode gives you our 5 favorite ways to stay “in like” each other. Thanks to Third Love Founders Heidi Zak and David Spector for joining us on today's episode. Heidi and David also gave our listeners a gift! They are giving you 20% off your purchase at Third Love, just go to thirdlove.com and use promo code Holderness. Go to www.theflourishmarket.com/holderness to learn more about Em and her mission (plus there's a discount code to her amazing shop). and get an extra 25% off when you keep all items in your box! Check out these timeless games from Marbles Brain Workshop. We love Otrio and Rock Me Archimedes http://po.st/MarblesTGT These are our favorite brainy games! Are you anxious about Thanksgiving conversations? Our hope is the real life advice from our counselor, Christopher Edmonston, will help bring families close together this Thanksgiving. Get your Clean Essentials Kit for just $22. Go to follain.com/Holderness and enter promo code "Holderness" at checkout for free shipping. Get your "Sip my Chardonnay T-shirts" here https://represent.com/holderness/limited-edition-holiday-chardonnay-shirts Available for a limited time! In this podcast, we are trying to find ways to do life better. We had a hilarious conversation with our favorite single person about the things we do that REALLY annoy her. Thank you for subscribing and leaving a review for The Holderness Family Podcast. We attending the Rise Together conference in Austin with the wonderful Rachel and Dave Hollis. Here's a little bit about the experience and an update on our path to self improvement. Parenting is hard. How do you show up for your kids? Sometimes just showing up on the sidelines is all they need. Thank you to our dear friend Josette Holland for this life advice. There are many great charities and so many people and pets that need assistance. Pick one. We are forever grateful. Go to TakeCareOf.com and Enter promo code "Holderness" for 25% off your first order. Changing the toilet paper is a secret contract we make? Who changes the toilet paper roll in your house? We have #ToiletPaperWatch2018 in ours and it did not end well. When mommy leaves: What happens when dad is in charge? Penn gets irrational, and Kim can't give up control. Thank you so much for listening. Would you mind leaving a review? It helps others find our show. Today we dive into life with ADD. We learn how to be a partner with ADD and parent a child with Attention Deficit Disorder. 7. GO TO FIVE STAR RESTAURANTS… at lunch. Same awesome food, same chef, fewer mean looks and easy to get a table! 6. People have sympathy for you…. MILK IT. The kids were totally into this podcast.. until they weren't. We survived our very first camping trip. How we did it and some CAMPING FAILS. The Holderness Family creates original music, parodies, and Vlogs for YouTube to poke fun of themselves and celebrate the absurdity in circumstances most families face in their day to day life. They published "Christmas Jammies" in December 2013 and life hasn't been the same. Since then, their popular parodies, "All About That Baste", "Baby Got Class," and original music "Snow Day" have received national news coverage. Penn, the Dad, took a chance and left his job as a news anchor to join his wife Kim, the Mom, at their video production and digital marketing company, Greenroom Communications, LLC. Lola and Penn Charles are always happy, respectful and eat all of their vegetables (that last sentence is a lie). Penn, Kim, Lola, and Penn Charles publish Vlogs and other nonsense to this channel as often as they can while remaining sane. Our viewers have become our family and we try our best to respond to comments. Does lowering your expectations increase happiness? Producer Max is on vacation and we go off the rails. In this episode of the HolderMESS podcast we talk all about Penn's plan to write a musical, the song he wrote to kick it off (https://www.youtube.com/watch?v=U5uMMsIYRKA) and how lowering your expectations may save your sanity. We are Penn and Kim Holderness. We make silly videos on the interwebs but this podcast is the REAL us. Thanks for being a part of this. Are you a helicopter parent? Kim is. Today we talk about how to ease off the over parenting and how it can help your kids. "Our wedding was NOT the best day of my life"
In this episode we dive into our former lives as television journalists, embarrassing mishaps, and how Kim flirted with George Clooney. About us: The Holderness Family creates original music, parodies, and Vlogs for YouTube to poke fun of themselves and celebrate the absurdity in circumstances most families face in their day to day life. They published "Christmas Jammies" in December 2013 and life hasn't been the same. It today’s podcast we cover why you hear Laurel and I hear Yanny. Also, some funny misheard lyrics. Then, we talk about why our dog bites people. Our Marriage Counselor says "Stay in Cleveland"
Please rate and review where you get your podcasts. We love your feedback. About us: The Holderness Family creates original music, parodies, and Vlogs for YouTube and Facebook to poke fun of themselves and celebrate the absurdity in circumstances most families face in their day to day life. They published "Christmas Jammies" in December 2013 and life hasn't been the same. Since then, their popular parodies, "All About That Baste", "Baby Got Class," and original music "Snow Day" have received national news coverage. Penn, the Dad, took a chance and left his job as a news anchor to join his wife Kim, the Mom, at their video production and digital marketing company, WalkWest. Lola and Penn Charles are always happy, respectful and eat all of their vegetables (that last sentence is a lie). Today we talk about the hardest part about being married, why Kim will smell the dirt underwear and hear Penn's random talents. Welcome to the HolderMess Family Podcast!